It's the northernmost die-off yet. Dead seabirds have again been found turning up on Bering Strait region beaches, making this the fourth consecutive year with unusual die-offs in coastal Alaska. The dead and dying birds, mostly murres, were first spotted in May on beaches at St. Lawrence Island and eastern Norton Sound, both near the Bering Strait, and at Shishmaref, just north of the strait, according to a report from Kawerak Inc., a Native-owned nonprofit organization in Nome. Some of those found alive are just barely so and struggling to stay above water, Kawerak reported. Since the first reports came in, more residents have come forward with information about dead-bird sightings. In all, hundreds of birds have been found so far this summer, meaning that it is likely that thousands of birds have died in the latest event, said Robb Kaler, a seabird biologist with the U.S. Fish and Wildlife Service. That means many more have died, with their carcasses lost to the ocean, he said. “I’d say thousands at this point, several thousands,” he said. Most of the dead birds have been murres, but there are other species, such as kittiwakes, Kaler said. This year’s dead bird discoveries follow a series of seabird die-offs in Alaska that have been linked to warm water conditions. A die-off of common murres in 2015 and 2016, with about 42,000 carcasses collected and an estimated toll of many hundreds of thousands out in the water, was the biggest ever recorded in Alaska. That was concentrated in the Gulf of Alaska, though it did extend to the Bering Sea. This year’s die-off is located in more northern waters, with the farthest south sightings to date at St. Lawrence Island and the farthest north sightings in the Kotzebue Sound area, Kaler said. Although hundreds of birds have been found, it is difficult to find a carcass that is fresh enough for meaningful tests into the cause of death, he said. So far, only one carcass has been fully examined at the U.S. Geological Survey’s National Wildlife Health Center in Wisconsin, Kaler said. Test results showed that bird, a murre, was emaciated. Kaler sent six more birds this week to the Wisconsin lab and is waiting for results. If there is stomach content found in any of those birds, that will be sent to the USGS Alaska Science Center in Anchorage to check for saxitoxin and domoic acid, two toxins that are produced by algal blooms that occur in Alaska when water temperatures are warm, Kaler said. Underlying causes of the new die-off are yet to be fully understood. “I don’t know whether it’s too early to talk about harmful algal blooms,” he said. But it is clear that marine conditions in the Bering Sea have been significantly warmer than in the past, with record-low ice all winter, early disappearance of that sparse ice and higher sea-surface and below-surface water temperatures, he said. Early ice retreat “always is going to have significant effects on the ecosystem,” he said. And warmer water temperatures affect plankton and fish populations and the parts of the food web that depend on them, he said. “If you have warm water, you’re going to have stagnation in that water column,” he said. In the aftermath of the 2015-16 common murre wreck, as the massive die-off was called, murre reproduction at colonies in the Chukchi Sea, Bering Sea and along the Aleutians was generally poor in 2017, the National Park Service reported. There were mixed results for reproduction among other seabird species in the area, according to the Park Service and Fish and Wildlife Service. 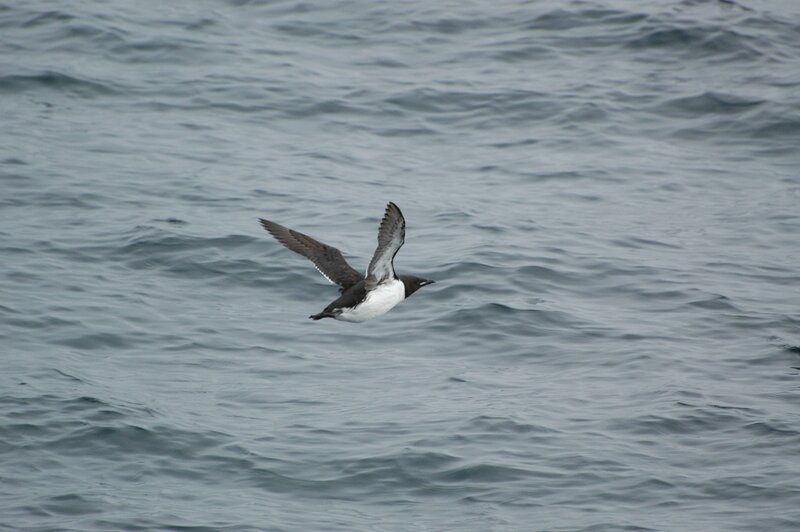 There were some complete failures, such as among kittiwakes in the Bering Sea, but some good results for murres and horned puffins along the Aleutians, according to the agencies’ reports. Collecting information about the dead and dying birds and survivors’ reproductive successes has been a cooperative effort in Alaska. It involves individual community members like teacher and avid birder Ken Stenek in Shishmaref, who has reported on some observed changes in bird behavior, Kawerak, the University of Alaska Fairbanks’ Alaska Sea Grant Program, federal agencies, the University of Washington-based Coastal Observation and Seabird Survey Team and other organizations. Through all the Alaska bird die-offs of recent years, the groups have learned to coordinate their observations, Kaler said. “Unfortunately, we’re getting really good practice at this,” he said.